Dungeons and Dragons Jones Soda, Still Available! Dungeons and Dragons is one of the most popular online games to date and still continues to evolve due to the influence of media technology. From the time it was launched, the game has always been consistent on the list of most played games of all time. Recently, Jones Soda launched its newest thirst-quencher collection dedicated to DnD gamers and fanatics. If you've heard about Jones Soda, I'm sure you are well aware about its great-tasting and unique beverages than can be fully customized according to the customer's preference. You can actually personalize the bottle labels and put your own photo or message on it. These sodas are ideal for any special occasion or for your everyday cravings. Dungeons and Dragons Jones Soda lets you feel spell casting like reality because of the different mouth-watering flavors in different magical names (Dwarven Draught, Potion of Healing, Sneak Attack, Eldritch Blast and Illithid Brain Juice, Bigby's Crushing Thirst Destroyer) as if you really are in the world of Dungeons and Dragons. Dungeons and Dragons Spellcasting sodas come in cases of six or twelve. 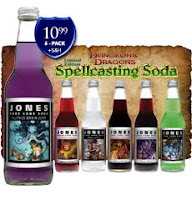 Visit their site to order DnD Jones Spellcasting Soda. This is a limited promotion, so hurry and get your Dungeons and Dragons sodas now while supplies last.